NEW!! The Console ‘Continuum’ Total Immersion Software! 131 Vital Factors = Amazing Accuracy! The Console Continuum, Total Immersion Software! What if we could take just three numbers and consolidate 131 total handicapping factors into these three ratings. Each number represents several dozen important critical handicapping considerations and each on their own perform an excellent job at sorting out contenders in just about any type of race. But when all three are added together you have a super performance tool/number that will lead you to not only the likeliest winner but also the highest percentage exotic possibilities including exactas and trifectas, Pick 3s/4s and even a fascinating way to construct low-cost pick five and pick six tickets giving you a much higher percentage possibility of hitting these wagers. 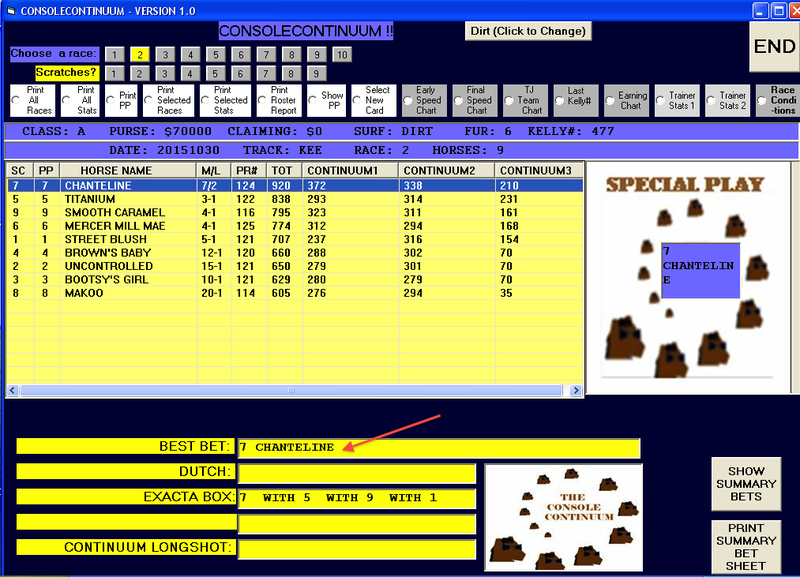 Well, that’s exactly what Tom Console has done in his new ‘Continuum TI Software’. “A lot of folks really like the database software I have produced, like RPG Optimum and URTI Extreme, but an equal number of players don’t really want to hassle with a database.”, Tom told us. So while going over some database angles with my brother Steve one day — we were testing several positive-ROI angles in various combinations to see if the overall return was enhanced — and Steve said ‘why don’t we just combine ALL of the angles/plus factors, etc., into three or four different categories, then test them individually and all combined’. While that would take some doing, to properly categorize each angle/factor, etc., it made perfect sense to at least give it a try. So we spent several days continually mixing and matching and sorting the critical handicapping considerations we wanted in the program. And we mean ‘continuous’ – a ton of hours were spent researching, calculating, etc., which is the reason we named the software ‘Continuum’. The software continuously calculates and recalculates favorable situations during the selection process (all in less than two seconds time!) and adjusts the final screen to what it deems the ‘optimum’ playing strategy. We added ‘Total Immersion’ to the title because the process is much like bobbing for apples — dipping into a bucket containing several dozen possible handicapping combinations/outcomes and coming up with the piece of fruit that provides the likeliest positive outcome. 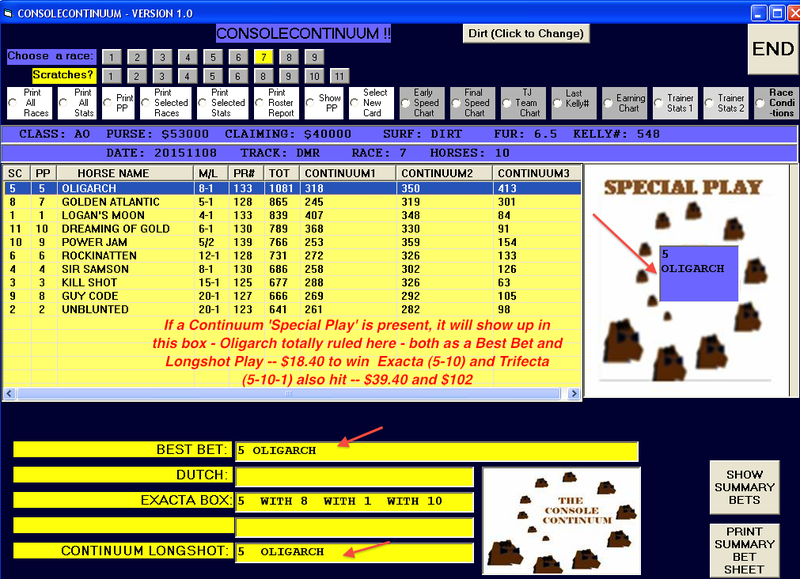 Below: Screenshot illustrating ‘Special Play’ box. BOOM!!! 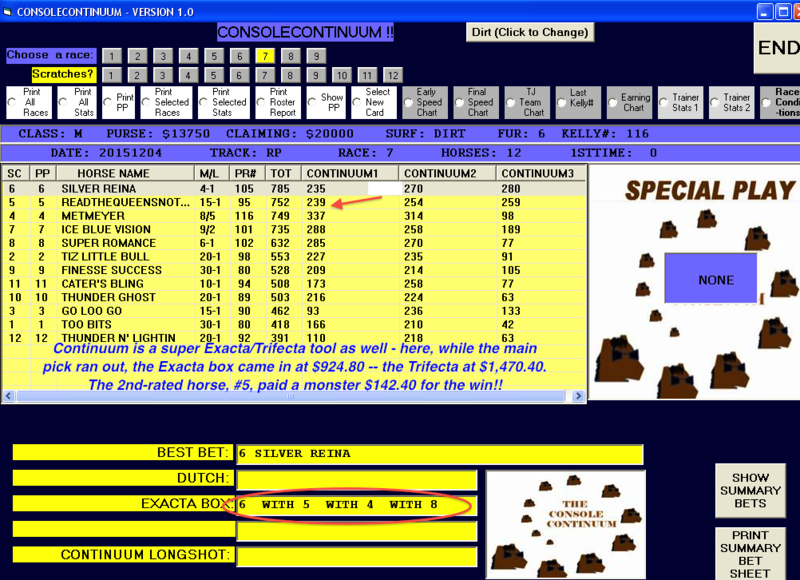 Continuum uncovers contenders that most fans would not take a second or third look at — check out this $142 winner, $924 Exacta and $1,470 Trifecta! Keeneland, Breeders’ Cup Day undercard – Chanteline was an overwhelming choice (look at her almost 100 point edge in the TOT (Total) column) but she paid a nice $8.60 and the Exacta box hit as well at $62. Below: A double-confirmation Continuum play. 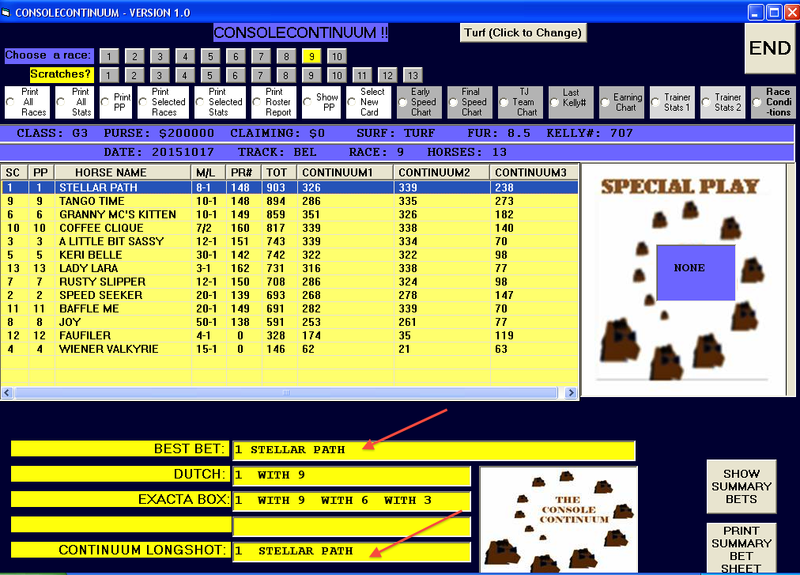 While Stellar Path did not make the ‘Special Play’ box she was nontheless a Best Bet Pick and a Continuum Longshot Pick. These are high-% propositions – $13.00 to win and $7.60 to place. Continuum 1 Column – Note: many factors in this column are based on a horse being among the top four speed or positionwise and the number of times, or %, that they are in this position/speed: Break speed% (% of times horse breaks among first four out of gate – this is at the 70- yards from the gate call); 1st call lead or near-lead %; 2nd call same; final call same; FG method; turn time %; K-Speed method; itm this distance %; itm this surface %. Etc. 28 other factors in this column. 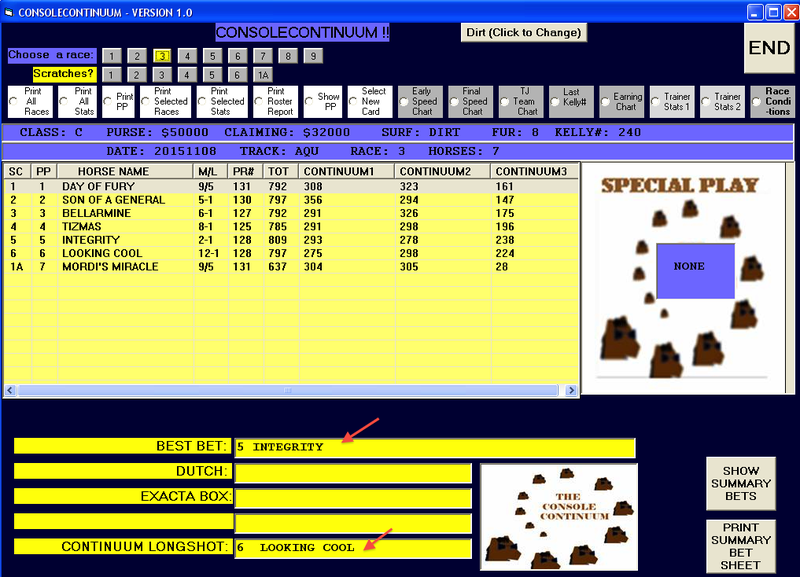 Continuum 3 Column – Note: this column is heavy with stats on the individual horse: lifetime win %; ytd same; lifetime win/place %; ytd same; lifetime win/place/show %; ytd same; proven best class 90 days; proven best class 1 year; sire proficiency last 12 months; same lifetime; dam proficiency last 12 months; same lifetime; sire surface proficiency lifetime; barn change proficiency – claiming races; today’s track record lifetime; etc., etc. 29 other factors in this column. So you can clearly see that The Console Continuum, Total Immersion Software is very, very, very COMPLETE. It deftly combines dozens of features that allows the software to select accurately both with straight wagers and with Exotics. >>>>You will also be provided with complete wagering instructions which include strategies to increase your percentage of hits in the horizontal (pick 3, 4, 5, etc) exotics as well as in the vertical (exacta, trifecta, superfecta). The Console Continuum, Total Immersion Software is just $148 and is ready to ship now. Call us with any questions: 1-800-696-0067 Thanks! Continuum/TPI Combo – just $177.50! !